At plumbers in Dublin water pumps are one of our specialties. 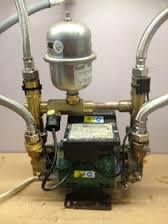 We repair, service and install all types of water pumps & heating pumps. Best of all we do this at unbeatable prices. We deal with all of the most popular water pumps include Stuart Turner pumps, Grundfos Pumps, Wilo pumps, Watermill pumps and Aquatech pumps. At plumbers in Dublin we provide a comprehensive 24 hours a day, seven days a week heating and water pump service. We cover all areas of Dublin and provide our expertise to both domestic, commercial and industrial customers. Whatever type of water, heat or booster pump you may have, we can provide a comprehensive service, repair, supply and fit for all makes and models of pumps. We cover all leading brands. If you do not see your particular pump manufacturer mentioned, don’t worry. We know all the types and manufacturers and would have no trouble sourcing the one you require. Water pumps at unbeatable prices! 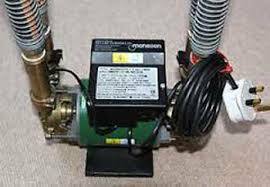 If you do need your pump replaced just call us for a free quote. Our prices start at €650 V.A.T. inclusive. We don't think you'll find that cheaper anywhere. Some of our water pump engineers have over 30 years experience in the plumbing and heating industry. All of our staff are fully qualified and R.G.I. registered. Also we make sure they are trained and certified in all aspects of health and safety. All our work comes fully guaranteed. We are fully covered by public and professional indemnity insurance. If you need your water or heating pump serviced, repaired or replaced, please call one of our local Dublin plumbers on 01-2603222. You will be able to speak to a senior member of staff. They will be able to answer any questions you may have. We offer our water & heating pump services throughout Dublin and surrounding areas without charging any call out fees.